When Tsawout band member George Underwood enlisted with the Canadian Forces in 1941 to serve in the Second World War, there were several reasons, chief among them was the preservation of his way of life. He was two weeks shy of his 17th birthday, and was clearly influenced by his older brothers Edward and Ben, who he followed into service. But the connection he made was more about defending the land and freedom he enjoyed, he told his daughter Mavis, who lives in the Tsawout family home with her mom, Geraldine. George fought in Italy, and was there at the end of the war, where he witnessed human rights atrocities that stayed with him all his life. Until the day he died at 90 years old in 2014, George was adamant that he never killed anyone, though many times he was nearly killed. “George was hit multiple times,” Mavis said. “He had a scar over his heart where the bullet came through his arm, shattered his collar bone. Another bullet grazed his head. He also had scars on his head from shrapnel. If it sounds familiar, there is a big screen movie, Hacksaw Ridge, coming out about American Desmond Doss who had a similar path, though George didn’t swear off guns per se, as Doss did. The magnificent Underwoods of Tsawout are the very reason Aboriginal Veterans Day was created. Without it, people outside the WSANEC Nation may never know of the historic bloodline the Underwoods carry. Of the three brothers, the least is known of Edward’s time fighting, as he died overseas. Edward managed to survive the war as a member of the Victoria-based Scottish Regiment’s Canadian Expeditionary Force 1st Battalion, but died in Holland on Nov. 17, 1945, likely of tuberculosis. Edward enjoyed the service and was awaiting officer’s training when he fell sick. 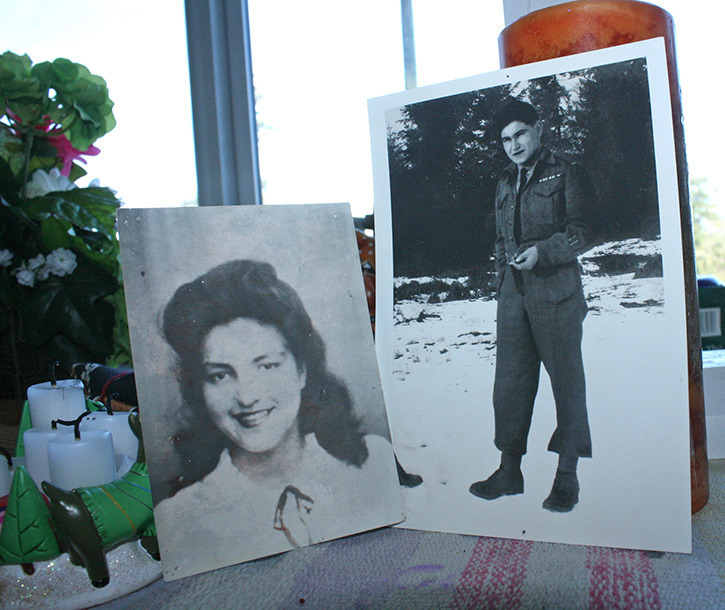 Ben never shipped overseas, and spent the war years as a royal engineer, mostly in B.C. doing road and bridge improvements. He died later on in life. In 2013, George was honoured with the Queen’s Jubilee medal as a surviving veteran. Before the war, all three Underwood boys, who were three of 10 siblings, attended a Coqualeetza Indian residential school near Chilliwack. George acknowledged there was physical and sexual abuse at the school. George also told tale of how the brothers who ran Coqualeetza tailored it towards agriculture. George learned to grow and harvest potatoes, use apples, and care for some of the best cattle stock in Canada. Unfortunately the food they grew rarely, if ever, made it to their plates. By the time George was set to return to Coqualeetza as a Grade 6 student, he chose not to. He had grown skills for hunting and harvesting and had begun to experience the freedom and independence of the territory. Later, alcohol became a factor in George’s life. It was said that Edward was a great athlete. So was George, who worked as a boom-man, who would run in his cork boots along the spinning logs in Plumper Bay (Esquimalt), but would drink on the weekends. He’d be away at camp, and return to visit Geraldine and their family, which grew to 16 children (Mavis was the fourth). Geraldine is 87 and her hands move swiftly as she knits Cowichan style garments like no other. She still lives in the same home they moved into 60 years ago, on a wee bay in Tsawout where George and others kept their boats. She remembers meeting George before and after the war. Geraldine doesn’t remember how she avoided residential school but certainly recalls the five-mile daily walk she made from her home to the Koksilah school. With 15 Underwood kids surviving, Geraldine and George have more grandkids and great grandkids than Geraldine can count. Alcohol became an increasing factor as he no-doubt suffered from PTSD, Mavis said. However, George did clean up for his final years, and made peace before he died.